AB - BACKGROUND:A region can be divided into agroclimatic zones based on homogeneity in weather variables that have greatest influence on crop growth and yield. The agro-climatic zone has been used to identify yield variability and limiting factors for crop growth. This study was conducted to classify agro-climatic zones in the state of Mato Grosso in Brazil for predicting crop productivity and assessing crop suitability etc.METHODS AND RESULTS:For agro-climatic zonation, monthly mean temperature, precipitation, and solar radiation data from Global Modeling and Assimilation Office (GMAO) of National Aeronautics and Space Administration (NASA, USA) between 1980 and 2010 were collected. Altitude and vegetation fraction of Brazil from Weather Research and Forecasting (WRF) were also used to classify them. 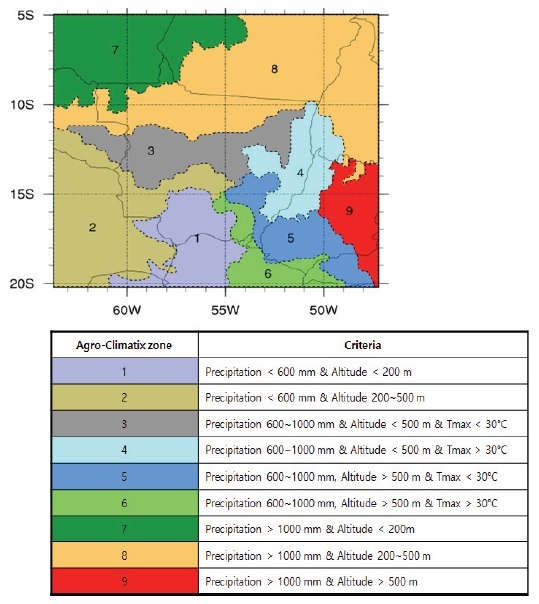 The criteria of agro-climatic classification were temperature in the hottest month (30℃), annual precipitation (600 mm and 1000 mm), and altitude (200 m and 500 m). The state of Mato Gross in Brazil was divided into 9 agro-climatic zones according to these criteria by using matrix classification method.CONCLUSION:The results could be useful as information for estimating agro-meteorological characteristics and predicting crop development and crop yield in the state of Mato Grosso in Brazil. Jung, M. P., Park, H. J., Hur, J., Shim, K. M., Kim, Y., Kang, K. K., & Ahn, J. B. (2019). Classification of Agro-Climatic Zones of the State of Mato Grosso in Brazil. Korean Journal of Environmental Agriculture, 38(1), 34-37. Jung, Myung-Pyo et al. “Classification of Agro-Climatic Zones of the State of Mato Grosso in Brazil.” Korean Journal of Environmental Agriculture 38.1 (2019): 34-37. 1. Jung MP, Park HJ, Hur J, Shim KM, Kim Y, Kang KK, Ahn JB. Classification of Agro-Climatic Zones of the State of Mato Grosso in Brazil. Korean Journal of Environmental Agriculture [Internet]. 2019;38(1): 34-37. Available from: doi:10.5338/KJEA.2019.38.1.4. Jung, Myung-Pyo, Hye-Jin Park, Jina Hur, Kyo-Moon Shim, Yongseok Kim, Kee-Kyung Kang and Joong-Bae Ahn. “Classification of Agro-Climatic Zones of the State of Mato Grosso in Brazil.” Korean Journal of Environmental Agriculture 38, no.1 (2019): 34-37. doi: 10.5338/KJEA.2019.38.1.4. A region can be divided into agroclimatic zones based on homogeneity in weather variables that have greatest influence on crop growth and yield. The agro-climatic zone has been used to identify yield variability and limiting factors for crop growth. This study was conducted to classify agro-climatic zones in the state of Mato Grosso in Brazil for predicting crop productivity and assessing crop suitability etc. For agro-climatic zonation, monthly mean temperature, precipitation, and solar radiation data from Global Modeling and Assimilation Office (GMAO) of National Aeronautics and Space Administration (NASA, USA) between 1980 and 2010 were collected. Altitude and vegetation fraction of Brazil from Weather Research and Forecasting (WRF) were also used to classify them. The criteria of agro-climatic classification were temperature in the hottest month (30℃), annual precipitation (600 mm and 1000 mm), and altitude (200 m and 500 m). The state of Mato Gross in Brazil was divided into 9 agro-climatic zones according to these criteria by using matrix classification method. The results could be useful as information for estimating agro-meteorological characteristics and predicting crop development and crop yield in the state of Mato Grosso in Brazil. 농업기후지대는 작물과 재배품종의 특정 범위에 기후적으로 적합한 주요 기후 및 생육기간의 관점에서 토지단위를 구분하는 것으로 기후적 요소의 동질성을 기반으로 구분할 수 있으며, 특정 지역의 상세한 기후정보를 바탕으로 한 농업기후지대는 그 지역의 농업기후자원 특성 파악을 통해 적합한 동식물, 작물품종 선택 등을 판단하는데 도움이 되기 때문에, 농업 생산력과 안정성 제고에 기여할 수 있다(Jung et al., 2015). 또한 해당지역의 농업기후자원의 간결한 인벤토리를 제공한다는 측면에서 가치가 있으며, 작물 생육 및 생산량 예측, 작물재배적지 평가등에 사용될 수 있다(van Wart et al., 2013; Reddy and Madiwalar, 2014). 또한 특정지역에 적응한 작물에 대한 다양한 기후요소의 영향과 기후변화에 따른 작물 재배적지 선택 등의 연구를 위한 기초자료가 될 수 있다. 농업기후지대는 기후적 요소를 단계적 방법(matrix method) 또는 클러스터 방법(cluster method)을 이용하여 구분할 수 있다(van Wart et al., 2013). 단계적 방법은 기온, 강수량과 같은 기후요소를 몇 개의 구간으로 나누어 기후지대를 구분하는 방법이다. 클러스터 방법은 통계적 계층화법이라고도 하며, 많은 변수를 다변량통계분석을 이용하여 대상지역을 격자로 구분한 후, 각 격자에 값을 할당하여 변수들의 동질성에 중점을 둔 구분하는 방법이다. Choi 등(1989)은 장기간 기후 자료(1973-1982)를 바탕으로 벼 생육에 영향을 미치는 기후요소를 이용하여 단계적 방법으로 한반도 내륙지방을 중심으로 벼 재배를 위해 19개의 농업기후지대를 구분하였으며, 벼의 안전재배기준, 벼 생산성 평가 등 농업연구에 활용되고 있다(Shim et al., 2013). Jung 등(2015)은 연평균기온, 최한월 평균기온, 최난월평균기온, 연누적강수량, 해발고도, 식생피복비율을 이용하여 단계적 방법으로 중국 동북지역을 22개의 농업기후지대로 구분하였다. Mueller 등(2012)은 해당 작물의 재배지역, 유효적산온도, 토양수분을 이용하여 단계적 방법을 이용하여 전 지구를 25개 농업기후지대로 구분하였다. Prentice 등(1992)은 토성, 월누적강수량, 일조시간, 증발산량, 유효적산온도 등을 클러스터 방법을 이용하여 전 지구를 17개의 농업기후지대로 구분하였다. van Wart 등(2013)은 농업기후지대를 구분하기 위한 단계적 방법과 매트릭스 방법을 비교하였으며, 또한 전 지구의 작물 잠재생산성을 평가하기 위한 농업기후지대 구분의 유용성과 한계를 평가하였다. 본 연구는 브라질 마토 그로소 지역의 농작물 생산량 예측을 위한 기초자료를 확보하기 위하여 농업기후지대를 구분하고, 대상지역의 기후자료를 수집하여 DB를 구축하기 위해서 수행되었다. 브라질 마토그로소 지역은 브라질 서부지역에 위치한 주요 농작물 생산지역으로 면적은 약 900,000 km2이다(Fig. 1). 마토그로소 지역의 남쪽은 열대 습지대이며, 북쪽은 아마존 습윤성 산림지대이다. 중부지역은 cerrado 라고 알려진 광대한 열대 사바나 지역이 우점하고 있다. 마토그로소 지역의 37%가 농업 및 목축으로 이용되고 있으며, 주요 재배작물은 콩(41%), 사탕수수(30%), 옥수수(24%), 목화(3%)이다. 마토그로소 지역은 브라질에서 콩이 가장 많이 생산되고 있으며, 옥수수는 두 번째로 많이 생산되고 있다. 2000년부터 2005년까지 콩 재배지역은 연 19.4% 정도 증가하였으며, 마토그로소 지역의 전체 농작물 재배면적은 최근 20년간 약 386% 증가하였다(2.43M ha, 1990년; 9.38M ha, 2010)(Brown et al., 2013). 콩-옥수수 2모작 작부체계가 주를 이루고 있으며, 최근에는 수수, 해바라기와 같은 작물 또한 많이 재배되고 있다. 브라질 마토그로소 지역의 농업기후지대를 구분하기 위하여 해당지역의 기온과 강수 기후장, 일사량, 그리고 해발고도 자료를 수집⋅분석하였다. 기온, 강수 기후장, 일사량은 미국 항공우주국(National Aeronautics and Space Administration, NASA)의 전 지구 모델링 및 동화 센터(Global Modeling and Assimilation Office, GMAO)에서 개발한 MERRA (Modern-era retrospective analysis for research and applications) 자료를 이용하였다. MERRA 자료는 Goddard 지구 관측 시스템(Goddard Earth Observing System, GEOS) 대기 모델과 자료 동화 기법을 통해 생산된 자료로 ½° 위도 × ⅔° 경도(약 50 km)의 수평 해상도와 지표면으로 부터 0.01 hPa까지 72개의 연직층을 가지는 고해상도 전지구 재분석 자료이다(Rienecker et al., 2011). 농업기후지대 구분을 위해 1991년부터 2010년까지의 30년 동안의 월평균기온 및 월누적강수량 자료를 이용하였다. 해발고도는 미국 지질 조사국(United States Geological Survey, USGS)의 지구자원 관측과학(Earth Resources Observation and Science, EROS) 센터에서 개발된 전지구 30초(약 1 km) 고도 자료(Global 30 Arc-Second Elevation, GTOPO30)를 이용하였다. Barnes 객관분석 기법(Barnes, 1964)을 적용하여 기상정보와 지리정보의 공간해상도를 같은 수준을 맞춰주기 위해서 약 30 km 해상도(Domain 1)의 기상정보에 거리 가중치로 계산하는 10 km의 수평 해상도(Domain 2)로 재구성하였다. 쾨펜은 전세계 식생 분포를 기후로 설명하기 위해 기온과 강수를 이용한 기후 분류체계를 제시하였다. 쾨펜 기후분류 체계에서 기온은 연평균 기온, 최한월 및 최난월의 월평균 기온으로, 강수는 연강수량, 최건월 및 최우월의 월강수량으로 각각 세분화되어있다. 본 연구에서도 쾨펜의 기후 분류체계와 같이 기온과 강수를 세분화하여 분석하였다. 최난월의 월평균 기온 30℃, 연강수량 600 mm, 연강수량 1000 mm를 구분 인자로 선택하여 단계적 방법으로 Domain 2 지역에 대해서 1차적으로 농업기후지대를 구분하였으며, 해발고도를 이용하여 2차적으로 농업기후지대를 구분하였다. 최종적으로 최난월 30℃, 연강수량 600 mm, 연강수량 1000 mm, 해발고도 200 m, 해 달고도 500 m를 브라질 마토그로소 지역을 포함하여 Domain 2 지역의 농업기후지대 구분 기준으로 사용하였다. 브라질 마토그로소 지역의 월별 기온 분포는 Fig. 2와 같다. 마토그로소 지역은 8월 이후 기온이 급격히 증가하여 10월 (30.2℃)이 가장 무더운 달로 나타났다. 마토그로소 지역의 최난월의 기온, 연누적강수량 및 해발고도의 지역별 분포는 Fig. 3과 같다. 마토그로소 지역은 최난월의 평균기온은 30℃를 기준으로 지역이 뚜렷이 구분되었다. 남서지역 및 중부지역은 30℃ 미만인 반면 그 외 지역은 30℃ 이상을 나타내었다. 연누적강수량은 남서지역에서 북동지역으로 갈수록 많아지는 특징을 보였으며, 해발고도는 남동지역이 대체적으로 높은 특징을 보였으며 400 m 이하인 지역의 비율이 높았다(Jung et al., 2015). 동일한 MERRA 자료 및 WRF 자료를 바탕으로 연평균기온, 최한월평균기온, 최난월평균기온, 연누적강수량, 해발고도, 식생피복비율을 이용하여 중국 동북지역의 농업기후지대를 구분하였다. 하지만, 브라질의 경우 최한월의 기온이 26℃ 정도의 높은 기온을 나타내기 때문에 농업기후지대 구분에 최한월의 기온은 고려하지 않았다. 또한 마토그로소 지역은 대부분의 영역에서 60% 이상의 식생피복비율을 보여주고 있으며, 많은 산림지가 농경지로 변환되고 있는 추세이기 때문에 본 연구에서는 고려하지 않았다. 브라질 마토그로소 지역은 최난월 30℃, 연강수량 600 mm, 연강수량 1000 mm, 해발고도 200 m, 해달고도 500 m의 지역구분 지준에 따라 Fig. 4와 같이 9개 농업기후지대로 구분되었다. 강수량 1000 mm 이상 및 해발고도 200–500 m 사이인 북동지역의 8지대가 가장 넓은 면적을 보였다. 최근 6년간(2012–2017) 브라질 마토그로소 지역의 농업기후지대별 월별 기후특성은 Table 1과 같다. 마토그로소 지역의 9개 농업기후지대의 연평균기온, 연최고기온평균, 연최저기 온평균은 각각 25.9℃, 29.6℃, 21.0℃를 보였으며, 연누적강수량평균은 1,287.5 mm, 연누적일사량평균은 2,309.4 W/m2를 나타내었다. 농업기후지대별로 4지대의 기온이 가장 높았으며, 강수량은 8지대, 일사량은 9지대가 가장 높았다. This study was supported by the Rural Development Administration under the “Cooperative Research Program for Agriculture Science & Technology Development” (Project No. PJ013452). Site map for agro-climatic zones in the state of Mato Grosso of Brazil. Domain 1 has 30×30 km resolution and Domain 2 has 10×10 km resolution. Change of monthly mean air temperature (℃) in the state of Mato Grosso of Brazil. 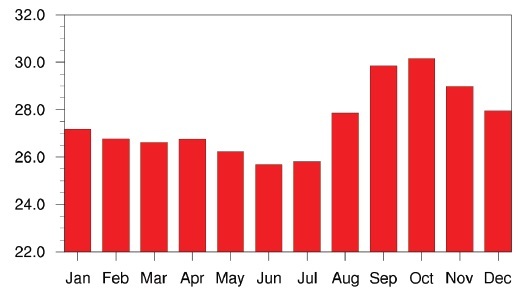 Distribution of (A) mean air temperature of the warmest month and distribution of monthly mean air temperature, (B) accumulated annual precipitation, and (C) altitude in the state of Mato Grosso of Brazil. Agro-climatic zones and their criteria in the state of Mato Grosso of Brazil. Tmax means the mean air temperature in the warmest month. 1. Barnes,S. L. ((1964)). A technique for maximizing details in numerical weather-map analysis.. Journal of Applied Meteorology 3. 396 - 409. 2. Brown, J. C., Kastens, J. H., Coutinho, A. C., de Casto Victoria, D., & Bishop,C. R. ((2013)). Classifying multiyear agricultural land use data from Mato Grosso using time-series MODIS vegetation index data.. Remote Sensing of Environment 130. 39 - 50. 3. Choi, D. H., & Yoon,S. H. ((1989)). Agroclimatic zone and characters of the area subject to climatic disaster in Korea.. Journal of Korean Society of Crop Science 34. 13 - 33. 4. Jung, M. P., Hur, J. N., Park, H. J., Shim, K. M., & Ahn,J. B. ((2015)). Classification of agro-climatic zones in Northeast district of China.. Korean Journal of Agricultural Forest Meteorology 17. 102 - 107. 5. Mueller, N. D., Gerber, J. S., Johnston, M., Ray, D. K., Ramankutty, N., & Foley,J. A. ((2012)). Closing yield gaps nutrient and water management.. Nature 490. 254 - 257. 6. Prentice, I. C., Cramer, W., Harrison, S. P., Leemans, R., Monserud, R. A., & Solomon,A. M. ((1992)). Special paper: a global biome model based on plant physiology and dominance, soil properties and climate.. Journal of Biogeography 19. 117 - 134. 7. Reddy, M. C., & Madiwalar,S. L. ((2014)). Productivity assessment and economic analysis of teak plantations in different agroclimatic zones of Karnataka.. Indian Forester 140. 287 - 290. 8. Rienecker, M. M., Suarez, M. J., Gelaro, R., Todling, R., Bacmeister, J., Liu, E., Bosilovich, M. G., Schubert, S. D., Takacs, L., Kim, G. K., Bloom, S., Chen, J., Collins, D., Conaty, A., da Silva, A., Gu, W., Joiner, J., Koster, R. D., Lucchesi, R., Molod, A., Owens, T., Pawson, S., Pegion, P., Redder, C. R., Reichle, R., Robertson, F. R., Ruddick, A. G., Sienkiewicz, M., & Woollen,J. ((2011)). MERRA: NASA’s modern-era retrospective analysis for research and applications.. Journal of Climate 24. 3624 - 3648. 9. Shim, K. M., Kim, Y. S., Jung, M. P., Kim, S. C., Min, S. H., & So,K. H. ((2013)). Agro-climatic zonal characteristics of the frequency of abnormal air temperature occurrence in South Korea.. Climate Change Research 4. 189 - 199. 10. van Wart, J., van Bussel, L. G. J., Wolf, J., Licker, R., Grassini, P., Nelson, A., Boogaard, H.B., Gerber, J., Mueller, N. D., Claessens, L., van Ittersum, M. K., & Cassman,K. G. ((2013)). Use of agro-climatic zones to upscale simulated crop yield potential.. Field Crops Research 143. 44 - 55.